There comes a time in every reader’s life when they are sorely tempted to club their favourite author on the head. With their own book, no less. My turn came very recently with Haruki Murakami’s 1Q84 which I attempted to romance over a course of 3 months. 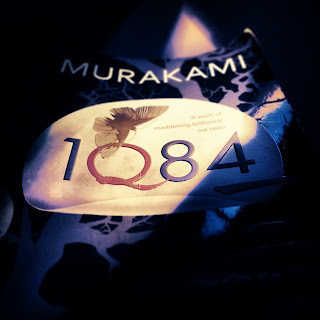 Forget that this book, desperately trying to be his “magnum opus”, is over 1300 pages long (in paperback) and that it could have done away with at least 1000 pages (the person who edited this book needs a tight slap too); 1Q84 is printed proof that Murakami is officially too full of himself (to put it mildly)! In the year 1984, we read into a world within a world in Tokyo, Japan. This world has two moons, something the author can’t reiterate enough, Little People, a cult organisation functioning under the guise of an organic farm and two protagonists whose fates are intertwined by a series of parallel events. 1Q84 is told from two perspectives – Tengo, a Math teacher who moonlights as a writer, and Aomame, a martial arts instructor moonlighting as an assassin. It gets off to a promising start. Tengo is commissioned to rewrite a novel for an inarticulate 17-year-old with a shady past, we’re intrigued already. On the other side of town, Aomame is commissioned to kill Leader (with a capital ‘L’), head of Sakigake, the organic farm disguised as a cult. Some 500 pages in, we’re about to give up, when we realise that Tengo and Aomame have a shared moment from when they briefly went to school together. The two, in fact, are in love with each other’s 12-year-old selves. How romantic! Suddenly, the book has intrigue, mystery and a fatalistic love story that could go either way. Heck, even the two worlds, two moons and the two lives of our two protagonists gain literary momentum. But another 300 pages in (that’s nearing 900 pages, with 400 to go) we reach, are dragged more like, to a climatic scene where Aomame finally meets this Leader, the chief antagonist of the novel whom you fear and loathe just a little less than Johnny Walker in Kafka on the Shore. A few too many pages of philosophy and un-gasp-worthy revelations in, Aomame “sends him to the other world”; simultaneously, Tengo is the subject of a really weird exchange with the 17-year-old monosyllabic writer whose work he rewrote and you suddenly realise, as a reader, you just…don’t…care…anymore! Murakami was and still is one of my favourite authors. Kafka blew my mind, while After Dark converted me to Magic Realism. I even started off the New Year resolving to read each and every work published by Murakami! But 1Q84 has taught me something very elementary about literature and the authors we idolise. They’re not golden geese. Every book of theirs cannot be a work of genius. I experienced this revelation for the first time with Carlos Ruiz Zaffon – loved Shadow of the Wind and The Prince of Mist, hated The Angel’s Game. But I dismissed that as the folly of a writer attempting to promise more mystery and mind blowing awesomeness than his story-telling skills could cope with. But now, with Murakami, I see this very mortal mistake at play once again. 1Q84 was destined for greatness. But it fails because of sheer volume and the author’s need to state, restate and reiterate facts, details and flashbacks he’s already tackled. It’s a waste of a story that could have blown your mind in 500 pages but instead, is stretched out to ridiculous proportions just so one man can have his giant ego printed across 1300 pages (in paperback).